Don’t let the small number of pages fool you, this great new book is loaded with information. 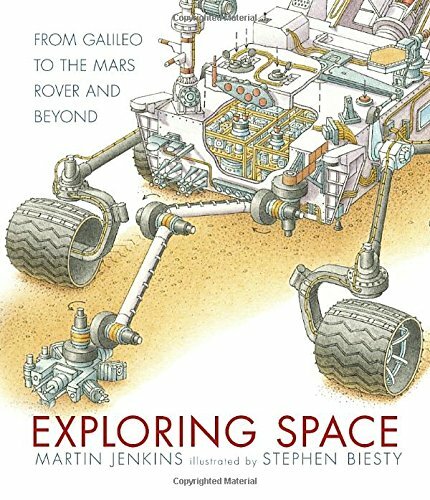 Comprehensive text is accompanied by no less than eight huge and detailed pencil drawings of telescopes, space suits, and other equipment plus smaller depictions of rockets, planets, and more. Human fascination with the stars goes back as far as humans do. Each time a little progress toward understanding is achieved, the focus and goals change. Originally, people struggled with what was the center of the universe and what made the stars move at night. After that, it was a matter or getting off the ground. Then traveling into space and returning safely after brief periods. Now, there’s a quest to discover life outside the earth’s atmosphere, to understand the origins of the universe, to use satellites wisely, and to safely travel and colonize at great distances. This book provides a great jumping off place for anyone already captivated by space exploration. It is also a must have for any classroom studying space, Galileo, technology, or the planets. And of course the more we find out about other worlds, the more we might come to appreciate how unique and precious our planet that we call home really is.